Students from Aquinas College have been in the patrols since 1996 and began by volunteering once every two months. The frequency of their volunteering slowly increased and is now eight times a month. 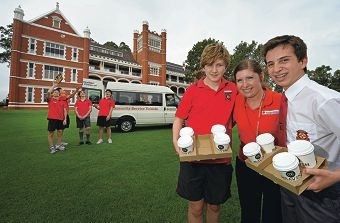 Aquinas at present has 47 students, four school staff and a team of two former students and their parents in the volunteer team for the Perth and Fremantle soup patrol runs. ‘We often call on Aquinas to assist with other events in Red Cross such as World Red Cross Day, Homeless Persons’ Week events and Services Sharing days throughout the year,’ Red Cross food security programs manager Narelle Little said. Aquinas has had more than 500 student volunteers take part. Director of Christian Service Learning John Richards has been involved with the soup patrol service since its inception at the school and plays a major role in co-ordinating the students. ‘We run 17 programs and this is one is always booked out well in advance,’ he said.